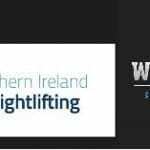 Our next competiton is the Autumn Championships being held at White Wolf CrossFit Lisburn. More information and entry forms will be published closer to the event time. Please note this event is being hosted on a rearrnaged date as stated in our calender of events published at the start of 2016.